Singapore operator M1 has made its camera-less iPhone’s official. They are now military approved. 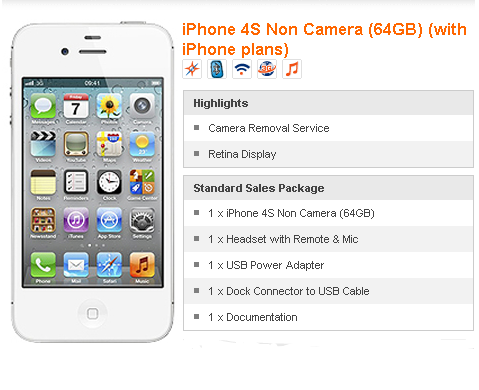 You get get the iPhone 4 camera-less with 8GB and you can get the iPhone 4S camera-less with 16GB, 32GB, or 64GB. According to M1, both front and back camera modules are completely removed, not just covered, and “may not be reinstalled”. The service has been certified by Singapore’s Ministry of Defence (Mindef), which means they will be allowed in army installations in the island-state. This benefits both full-time soldiers and many Singaporean men who are required to fulfill two years of mandatory military service. M1 will issue a certificate with each non-camera iPhone that will identify it as being approved by Mindef.